Tips for use. Of course the justice referred to in the quote was in England. 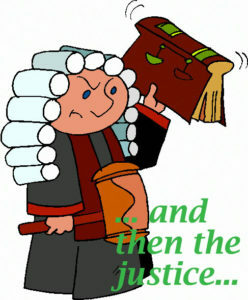 Of which (the English justices) Thomas Jefferson said, “For Heaven’s sake discard the monstrous wig which makes the English judges look like rats peeping through bunches of oakum.” Where ‘oakum’ is a kind of loose fiber from untwisted rope, and mixed with tar, used to caulk wooden ships. This is the fifth age of man in the total of seven. To locate the previous related blogs, the “ages of men, all the world is a stage” etc., the introduction to these famous Shakespeare lines is in the blog of Feb 29, 2012. Stage 1 – the infant, in the blog of Apr 9, 2012; stage 2 – the whining schoolboy in the blog of Jun 2, 2012; stage 3 – the lover, in the blog of Jun 8, 2012; stage 4, the soldier in the blog of Jun 12, 2012. In the play. Jacques philosophizes in the forest of Arden. ‘Capon’ is a castrated chicken and a typical gift to a judge. ‘Capon-justice’ was a term used to indicate a judge who could be bribed with a capon. ‘Saws’= ‘Maxims, sentences’. This entry was posted in After Dinner Quotes, Amusing Shakespeare, Best Shakespeare Quotes, Chances Quotes, Motivational Sayings, Philosophical, Psychological & Historical Considerations, Sayings about Life, Shakespeare in Management, Shakespeare in Politics, Social Exchanges Shakespeare style and tagged as you like it, best shakespeare quotes, effective communications, injustice, judge quotes, justice quotes, presentation ideas, quotes about justice, seven ages of man, Shakespeare in Politics, shakespeare social quotes, the world is a stage. Bookmark the permalink.